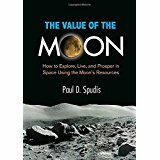 Paul Spudis presents a convincing case for returning to our natural satellite in his outstanding book “The Value of the Moon; How to Explore, Live and Prosper in Space Using the Moon’s Resources”. Spudis is a geologist and Senior Staff scientist at the Lunar and Planetary Institute in Houston Texas, so he knows his stuff. The book is well written and researched with extensive references. After a brief history of humanity’s fits and starts attempting to return to the moon, Spudis lays out the value proposition for why the moon should be our next destination in space. There are three primary reasons it makes sense to go back. Proximity, scientific worth and useful resources. The closeness argument is a no brainer. Should anything go wrong during operations on the moon its only 3 days away. Radio transmissions take only three second round trips and launch windows are abundant. Next, the moon is an interesting destination for scientific research. The geological processes and solar wind record in the lunar regolith provide a rich vein of knowledge just waiting to be mined on the history of the solar system. Of course, the far side has been recognized for many years as an ideal location for a radio astronomy. Finally, the lunar environment is a perfect space-based laboratory providing hard vacuum, temperature extremes and low gravity conditions for experimentation of physical and biological phenomenon that need to be understood for operations on the moon. Finally, Spudis gives a very detailed account of the moon’s valuable energy and material resources, the exploitation of which would enable humanity’s spacefaring capability. Lunar regolith can be refined into construction materials used for thermal and radiation shielding obviating the need to transport materials from earth, thus lowering the cost of lunar settlement. Of course the holy grail is the water ice and unlimited solar energy present at the lunar Poles, which is where most of the value in the moon resides. Spudis, as deputy leader of the science team of the Clementine mission, dedicates several pages to their landmark discovery of the likely presence of frozen water deposits at the south lunar pole in 1994. Yet he only introduces the follow-on SSI supported Lunar Prospector (LP) spacecraft which confirmed the presence of water in one paragraph as the first of NASA’s low cost Discovery missions, which he says was due to “renewed interest” in the Moon because of Clementine. Spudis had to pack much research into the case for returning to the Moon, so unfortunately, he didn’t have room to mention LP’s history and quite frankly, this was not germane to the scope of the book. So sadly, there was no mention of the early conceptual work on LP coming out of NSS’s early advocacy efforts and SSI’s grass roots and financial support in the eighties, well before the Clementine results. The principal investigator of LP, Alan Binder, published a book called “Lunar Prospector Against All Odds”, that documents the story of Lunar Prospector including all of the O’Neill and SSI letters and documents. Of course a lot more information about LP and research on in situ utilization of lunar resources can be found in the archived newsletters of SSI, which has been chronicling studies on the value of the Moon for decades. To be fair, the lack of LPs background is a minor detail that can be overlooked considering the compelling rationale Spudis’ elegantly articulates for a cis-lunar infrastructure. In the remaining chapters he lays out a very detailed plan for a return to the moon to unlock and profit from its valuable resources. This book would be a valuable addition to the bookshelves of all space advocates.